Chives, a perennial grassy looking green with a mild onion-like flavor, are a kitchen essential, providing that onion-like flavor where the assertiveness of onion itself would not fit. They are one of the classic fine herbes. There are several named chive cultivars, but most seed catalogues act as if they were unveiling The Secrets Of Isis just to distinguish between ordinary chives and garlic chives (which is a distinct species, A. tuberosum, not a cultivar of ordinary chives). A few seedsmen carry the variety Grolau (aka “Windowsill Chives”), which was reportedly developed especially for indoor growing, and that one is our choice. Chives sprout easily from seed, after which they can easily be propagated vegetatively by clump division—or you can cut the cackle and just buy a plant (they are perennials). They are said to prefer a sunny position in a rich, moist, but well-drained soil, but are also said to be quite forgiving of adverse conditions. Chives generally like moist (but not soggy) soil. Chives tolerate heavy harvesting, and regular cutting of the leaves not only insures a continuous supply of young leaves, it prevents the plants from flowering. (If they do flower, pinch off the buds.) Harvest by cutting some, or even all, of the leaves—but be sure to cut close to the soil level, so the plant “knows” to send up new leaves. A little balanced organic fertilizer every season would not go amiss. 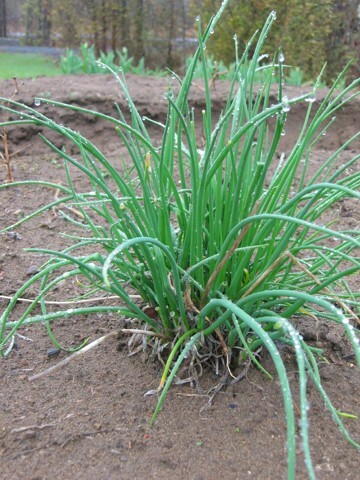 It is considered wise to re-divide one’s chives every few years, to maintain plant vigor. Division can be done almost anytime, but is probably best done in spring. It was last modified on Monday, 4 February 2019, at 02:21 EST.